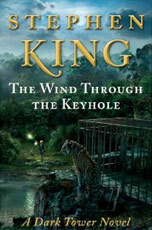 Fans of Stephen King’s Dark Tower series will rejoice with the release of the new book The Wind Through the Keyhole. Those who have been jonesing for more stories about the Gunslinger Roland Deschain and his adventures through Mid-World, will get the rush of plunging into the author’s incredibly detailed Western/Sci-Fi/Fantasy world for the eighth time. 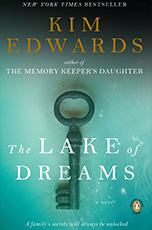 This book, considerably shorter than the last few novels of the series, is a detour that falls between the fourth book Wizard and Glass and the fifth book Wolves of the Calla, in the Dark Tower timeline. As Roland and his ka-tet (Eddie, Susannah, Jake, and Oy) take refuge from a destructive storm, he recounts a story from his youth, the hunt for a vicious shape-shifting serial killer. The teenage Gunslinger investigates the murders, and befriends a young boy left bereft in the wake of the shape-shifter’s violence, comforting him with a mythical legend. Thus begins an intricate story within a story, crafted with King’s signature style and imagination. Listen to Stephen King read an excerpt from The Wind Through the Keyhole in an exclusive Entertainment Weekly audio clip.